Who doesn't love a good peanut butter cookie? 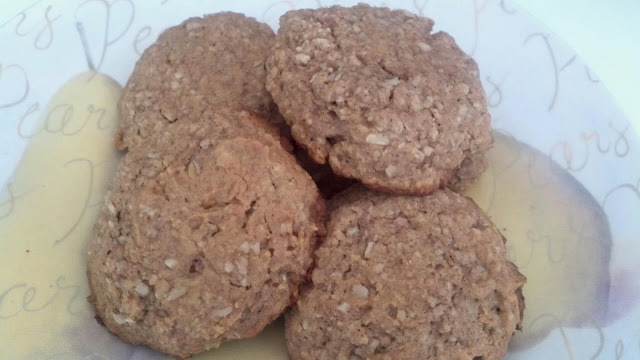 This recipe is a little higher on the sugar and oil content than others I have posted, but I wanted to make something closer to a traditional peanut butter oatmeal cookie. This recipe made two dozen large cookies (heaping tablespoons of dough), so they can also be made smaller if you prefer a larger yield or smaller serving size. Preheat oven to 350 degrees F. Grease two baking sheets with canola spray. Grind oats into a flour in food processor and pour into a large mixing bowl. Add flour, baking soda, baking powder, salt and spices and mix until uniform. Add peanut butter, honey, coconut oil, vanilla and egg to bowl. Mix contents together (you may need to mash coconut oil with a fork if it is solid). Scoop out heaping tablespoons of dough and form into mounds on baking sheet. Use the back of a fork to lightly press down the tops of the mounds. Place in the oven and bake for 8 to 9 minutes. Remove from oven and allow to cool on baking sheet for 5 minutes before transferring to cooling rack.